Fact: It’s been a year since my last post. Fact: It’s also been a year since I’ve been tempted to complete an Asian drama series. That said, I have thoroughly enjoyed this Taiwanese drama – so much that I’m motivated to post again and encourage everyone to check it out. In Time With You features veteran actress and one of my favorite female leads, Ariel Lin. We last saw her in a classic Wuxia piece, Legend of the Condor Heroes, where she played a bubbly but mischievous young girl with magical powers. In this new piece, she is a 30-year-old modern career woman who’s both parts romantic and cynic. Good or bad? That’s a tough question for this drama. It definitely had it high points but the plotline never went the direction that I had wanted. I watched almost all the episodes, skipped most of the scenes between the two major characters and prayed that Guan Xi (Ming Dao’s character) would be successful. The major downfall of this drama is basically that they hired two models who can’t act as the lead. Xue Ge as a character was simply pitiful. I felt no pull toward this person. He makes mistake after mistake and has almost no idea what’s going on to people around him most of the time. Couple the weak character with a bad actor, I was of course rooting for the other guy. Guan Xi was another story. This was a person who knew what he wanted and went after the girl with the suave and tactical moves of a male lead. Ming Dao perfectly portrayed confidence mixed with a bit of cockiness. Maggie Wu just got on my nerves most of the time. In the drama, she had the whiniest and nasal-est voice ever! I realized that this was not her real voice from watching her on other shows but they really messed up her voice. It drove me crazy in some scenes. Now this is her first major role but her performance was not up to par. Her body is amazing so I think they should keep her in the modeling industry. But give her some acting lessons before you put on the screen again! Maybe some of you were more receptive to the new actors and tolerant of the plotline, let me know if you totally disagree with me or if you know where I’m coming from. Despite all my complaints, I did finish the series. One last complaint, terrible ending! Why am I deviating from my usual romance-based drama? Because Black & White’s got Vic Zhou (Zai Zai) and hot new guy (Mark Chao). I think these two are reason enough. From the first two episodes, the action shots are very well directed. This is definately a high budget show. Will elaborate when more episodes come out! Cutest drama I’ve seen in a really really long time. The three major characters can all be described as cute. Even the English name of the drama: To Get Her = Together. Adorable! As for the main players, I like the fact that Rainie’s character is very solemn. I’m usually not a fan of her upbeat/hyper personality but as the character of Chen Mo Mo, she is forced into a quite role. I love it! She is much more lovable when she is solemn (i.e. her older music video for Ideal Lover). It’s long (54 episodes) and it has way too many major characters (31 just look at the poster!) but it’s one of the best real life stories I’ve seen in a while. The story starts in the 1960’s in a small community in Taiwan. The drama is revolves around the lives of several families who are closely tied to each other. It begins when most the major characters are still children and follows them through their rebellious age, their first crush, their growth into adults. It is truly a story of “laughter and tears”. Their childhood and young adulthood is filled with innocent mischief, and the bonds between friends are amazing. ‘Story of Time’ is also filled with history. Many of the family are filled with retired soldiers who left their families in mainland China. They are banned from returning in the ’60s and starts a new life in Taiwan. I’m not clear about the actual history if that period but this drama is a great way to get a taste of life in that period. I was definitely expecting this drama to be another one of those immature jokes that the Taiwan entertainment industry occasionally pushes out. After a few episodes (Ok, I watched all ten episodes that have aired within a week! 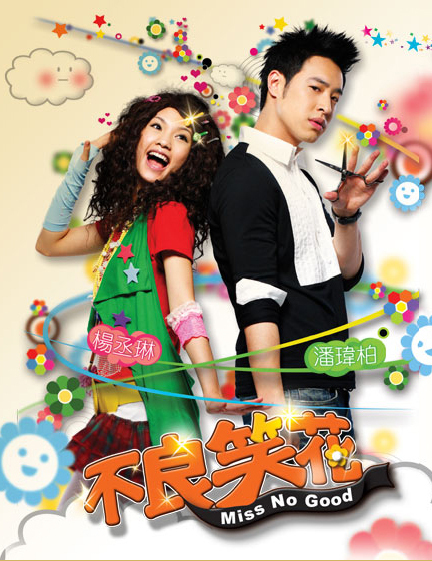 ), Bu Liang Xiao Hua or Miss No Good is in reality refreshing and sometimes funny. Rainie Yang does a good job playing a untypical girl with a screwed fashion sense. I was really excited to see Wilber Pan as an actor and I’m not at all disappointed. In most dramas, the male lead is obviously trying to look handsome on camera with deliberate poses. (*cough* Mike He *cough*) I don’t know if Wilber’s doing the same thing, but he seems like a natural actor. I’m going to keep on watching as new episodes come out each week. Don’t know if this drama is really for you? Just skim the first episode or two and you’ll know if you totally hate or love the main characters. Thoughts based solely on the first episode which btw you can now watch online. Jerry Yan returns as his best played character – handsome rich boy with attitude. Love it! I truly believe that only Jerry has the amazing bone structure to perfectly pull off a condescending yet attractive look. (That’s right, in the world of drama, sons of rich families always have cheekbone that are more spectacular than normal. Their fathers always seem to carry prominent mustaches.) As of now, the audience haven’t been attacked by Jerry’s full blown smile yet. Even his reluctant turn of the lips, a secret smile to himself, is so cute! I expecting ratings to go off the roof when Jerry finally shows his signature dimples later on. On to Alan Luo… he’s also playing a character that really suits him. Sadly even after gaining great popularity in Taiwan, he still has that poor boy look. So playing the orphan Yuan Da Ying is totally appropriate. Alan Luo on any screen has always cracked me up. His facial expressions might sometimes seem immature but they come naturally to his face. I hate it when actors force themselves to be funny. Alan is just a pro by nature. Look for more MP3s on the Downloads page.